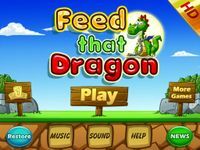 Feed the Dragon is an iOS puzzle game with single-screen stages. The goal is to catapult a meal into a dragon's mouth, such that the food passes between all three scoring stars on the way. Successful trajectories get steadily more complicated as the game introduces portals, black holes, waterfalls, etc. The game comes with 30 levels, and additional level-packs may be purchased in-game.